T-Mobile USA on Wednesday announced that it has named John Legere as the chief executive officer of the carrier's business unit. His tenure will begin officially on Sept. 22, and he follows in the footsteps of Jim Alling, who has served as the interim CEO since June. Alling will return to serving as the carrier's chief operating officer. Legere is no stranger to serving as the head of a company; he is the former CEO of Global Crossing and has spent 32 years inside the U.S. global telecommunications industry. "John is a talented and proven executive who brings a successful track record of leading and operating consumer- and business-focused telecommunications and technology companies," CEO of Deutsche Telekom René Obermann said. "As T-Mobile moves forward with its strategic initiatives to improve its market position, including expanding its network coverage and initiating LTE service, John has obviously the right skillset to lead the business into the future. John's experience in the telecommunication and technology industries at Global Crossing and Dell will enhance T-Mobile's ability to deliver superior mobile experiences for our customers as the Company continues to strengthen its business. I am delighted to welcome John to T-Mobile and look forward to working with him to make T-Mobile a stronger competitor." Deutsche Telekom (OTCQX: DTEGY), one of Europe's leading telecommunications and information technology service companies and the parent company of T-Mobile USA, today announced that John Legere, a 32-year veteran of the U.S. and global telecommunications and technology industries, has been named Chief Executive Officer of its T-Mobile business unit, effective September 22. 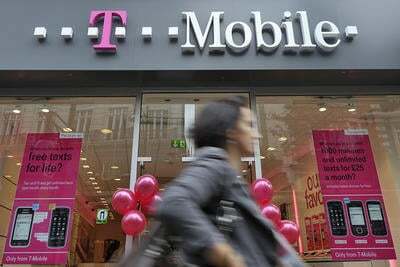 He succeeds Jim Alling, who has served as interim CEO since June and will return to his position as T-Mobile's Chief Operating Officer. Mr. Legere, 54, is the former CEO of Global Crossing, where he successfully transformed the company to become a leading provider of IP services worldwide. Under his direction, the company completed the world's first integrated global IP-based network, achieved near-perfect network operations and significantly improved customer satisfaction. "John is a talented and proven executive who brings a successful track record of leading and operating consumer- and business-focused telecommunications and technology companies," said René Obermann, CEO of Deutsche Telekom. "As T-Mobile moves forward with its strategic initiatives to improve its market position, including expanding its network coverage and initiating LTE service, John has obviously the right skillset to lead the business into the future. John's experience in the telecommunication and technology industries at Global Crossing and Dell will enhance T-Mobile's ability to deliver superior mobile experiences for our customers as the Company continues to strengthen its business. I am delighted to welcome John to T-Mobile and look forward to working with him to make T-Mobile a stronger competitor." "I am thrilled to join T-Mobile and lead the Company at such a pivotal time," said Mr. Legere. "T-Mobile is taking a number of significant steps to revitalize the business and I look forward to leading our team and partners to accelerate these efforts to become a force in our industry." Prior to joining Global Crossing, Mr. Legere was CEO of Asia Global Crossing, a Microsoft, Softbank and Global Crossing joint venture. Before that, Mr. Legere served as Senior Vice President of Dell Computer Corporation, where he was President of the Company's operations in Europe, the Middle East, Africa, as well as in the Asia-Pacific region. From 1983 to 1998, Mr. Legere worked at AT&T, where he served in a number of senior positions, including President of AT&T Asia, President of AT&T Solutions Outsourcing and head of global corporate strategy and business development. He began his career at New England Telephone in 1980. A Massachusetts native, Mr. Legere received a bachelor's degree in business administration from the University of Massachusetts. He earned a master's degree in science as an Alfred P. Sloan Fellow at the Massachusetts Institute of Technology. Additionally, he received his Master of Business Administration degree from Fairleigh Dickinson University (FDU) and completed Harvard Business School's Management Development Program in 1989. "On behalf of Deutsche Telekom and T-Mobile, I want to thank Jim for his effective leadership during his term as interim CEO. Jim is an instrumental member of our team and will continue to play a key role in guiding our strategic direction. We are pleased that T-Mobile will continue to benefit from his leadership and experience as he resumes his position as COO," continued Mr. Obermann.